It’s a rainy morning in Perth when we set off for Swan Valley, but Sylvia Mills from Luxury Outback Tours and I can’t wait to hit the country roads that wind off into the verdant hills barely half an hour after leaving the CBD. “The sweet treats will taste the same whatever the weather is doing,” Sylvie assures me with a laugh. 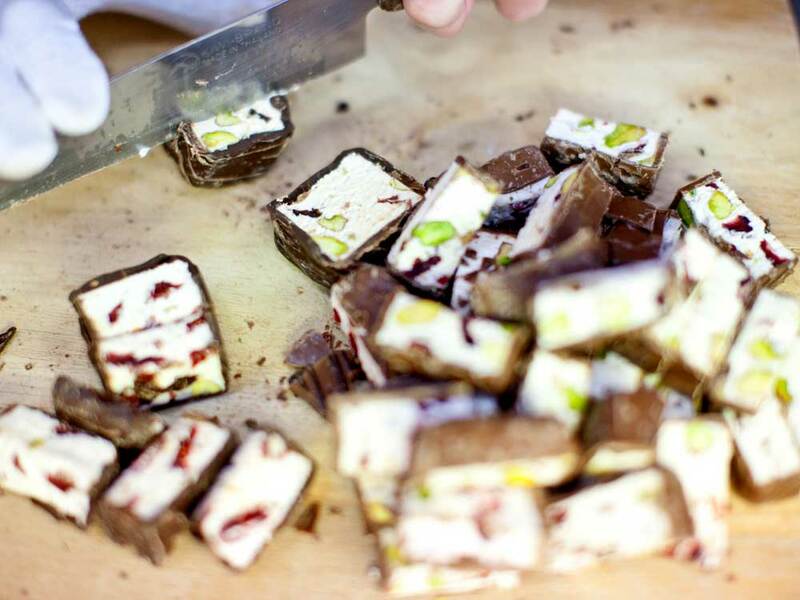 Our first stop in Swan Valley is a double-dipping treat, as in two adjoining buildings – Mondo Nougat and Morish Nuts. Both companies had humble family-run beginnings, but today each has claimed its rightful place on the Australian gourmet snack stage. He holds out a platter scattered with crunchy vanilla nougat pieces, which taste as good as they crunch, and then I move on to some of their other popular varieties, such as the chewy macadamia and honey, pistachio and almond, and my favourite, salted caramel. I bite into a cranberry and pistachio, followed by a soft vanilla. Just as delicious. Sylvie snaps a photo of me in front of the cute aqua green Italian Fiat that’s loaded up with nougat, and I buy a cooler bag filled with every type on offer (justifying this with the fact that Easter is around the corner). Then we watch the show in the production room, where bakers are cutting large slabs of freshly cooked nougat into little oblong treats. Like a true Nonna who can’t feed her family enough, the (somehow) slender manager offers me a taste of the homemade gelati, and he won’t let me escape without sampling the famous Mondo Nougat Cheesecake. Who am I to refuse? A hop, skip and a jump takes us into Morish Nuts. Twenty years strong, this family business disrupted the snack scene a decade ago, using a family recipe prepared in their Swan Valley kitchen to reinvent the approach to bagged nuts. Branding helped this local business stand out and thrive – the bold black-and-white striped packaging featuring a grinning peanut man in a top hat and bow tie holding a walking cane is as recognisable as he is joyous. One can’t help but grin like the Morish peanut man when you discover the range of nutty offerings, such as hot and spicy caramel-coated cashews and pistachios, praline with hot and spicy caramel and chilli, lime zest and spices, abalone- and truffle-flavoured macadamias, and Peanut Crunch (a slab of popcorn and peanuts smothered in a rich caramel butter coating with a sprinkling of coconut) and Peanut Brittle. My favourite is the wasabi macadamias. If you have only ever consumed mainstream processed honey, then you haven’t really experienced true honey. Honey is a food worth dedicating your life to, as we come to understand when we meet the passionate beekeeping couple behind House of Honey – Rupert and Kim Phillips. The incredibly busy store and tasting room are proof that patience and passion for natural produce pays off. She guides me through the crowds to the tasting table, where there are more then 20 different varieties of honey on offer. The Jarrah variety is a stand-out. Amber-coloured with a malty flavour, it is renowned for its high antibacterial and antimicrobial properties. I also love the Banksia flavour, which is citrusy and so ideal for peppermint tea, and Blackbutt (dubbed the Guinness of honeys), which is heavy and thick. There are endless plants and trees that bees can extract pollen from, and the result means an enormous range of taste sensations. “So many people don’t realise how different one honey can be from another,” Rupert says. We finish off our tasting, buy some Jarrah honey (when in Rome… ) and wrap things up by tasting the company’s range of meads and honey-infused liqueurs. For those new to it, mead is an alcoholic beverage created by fermenting honey with water, sometimes with various fruits, spices, grains, or hops. The delectable drinks warm the belly and coat my lips with another kind of sweetness. Next, Sylvie and I decide it’s time to indulge my craving for something else that the Swan Valley is famous for: cheese. Set metres from Olive Farm Wines cellar door, The Cheese Barrel is all about enjoying local and international artisan cheeses with matching wines, locally roasted coffee, and more sweet treats if you so desire, in a shed with floor-to-ceiling glass doors that open on to a wooden deck set up for outdoor tastings and lunches, with stunning views of Susannah Brook. The rain has stopped, and, as I settle in for a cheese tasting, a rainbow arches across the paddock and the fields are bathed in a warm golden light. People look up from their wine and platters, exclaiming over the storybook vista. I decide to come back again, pledging to spend an entire afternoon here enjoying the setting and the world-class produce. As it’s past midday (“It’s 5pm somewhere in the world,” says Sylvie with a grin), it’s high time for some wine tasting. And what better way to kick off than with a tasting at one of the original wineries in Australia, Houghton Wines. Established in 1836 when three army officers bought land in the Swan Valley just four years after Western Australia was colonised, it is one of the country’s oldest operating wineries. In 1937 its signature white burgundy, Houghton White Classic, was released, making a huge splash in the wine world. It’s still famous today and is the perfect barbecue wine. The wine tasting was enough of a treat, but the bar was then raised when Iron Chef Australia winner Herb Faust, who runs the café at Houghton, brought out some of the tastiest bite-sized dishes I’ve ever come across. Some of his most popular dishes are savoury churros with jamon, caramelised pear and Cambray blue cheese; Margaret River wagyu with green mango, crisp fish and hot and sour sauce; and fritters of queso Mahon (a Spanish cow’s cheese) with charred corn, avocado and jalapeño mojo. Truth be told I’m rather full by this stage, but I make time for a late lunch at Sandalford Wines, where the restaurant is one of the busiest in the valley, attracting large groups as well as those after an intimate experience. Founded in 1840, Sandalford is one of Western Australia’s oldest and largest privately owned wineries. The cellar door doubles as a large store offering all sorts of wine paraphernalia, and the tastings can include Estate Reserve, and Margaret River and Element Wines, as well as ultra-premium drops. The grounds are well worth a leisurely wander, and you’ll find some of the oldest vines in the country, planted in 1890, in a pretty-as-a-picture lush garden patch that is an ode to the early days of Australia’s winemaking. En route to the restrooms, check out the hallway and grand staircase where there’s barely any wall room left, as it’s plastered with framed concert posters showcasing the famous musicians who have performed here. The signed pieces from Sandalford’s colourful past are nothing short of gobsmacking. Pretty much any band you’ve ever heard of, and any musician of merit – and even all those awesome one-hit-wonders you may have forgotten – have entertained the crowds here. I sit in the afternoon sun on the outdoor patio and tuck into the Ferguson Valley lamb rump with charred carrot purée, Wanneroo sugar snaps, shallots and a mint jus, beautifully paired with a Sandalford Cabernet Merlot. The fallen rain has the gardens, vines and green grass glistening. I skip desert, but only because I have a plan for later. I’m staying at the hot new hotel in Perth: the glamorous, uber-stylish Westin, so Sylvie and I cruise back to the city and the porter loads my five bags of goodies on to the bell boy’s cart. Due to genius forward-thinking – or rather, knowing in advance that nothing excites me more than taking locally made treats from a wine region home to share with friends and family – I have an empty suitcase ready to roll. Speaking of rolling, that’s what I do: through the lobby and up to my stunning modern suite, where, after a snooze, I can’t resist opening a bottle of white burgundy and having an evening glass of wine while the sun sets across Perth. Then I open some Morish wasabi macadamias, and arrange a little slab of camembert and a couple of pieces of crunchy vanilla nougat on a plate. My day of swanning is over, but my evening of delectable delights is just beginning.